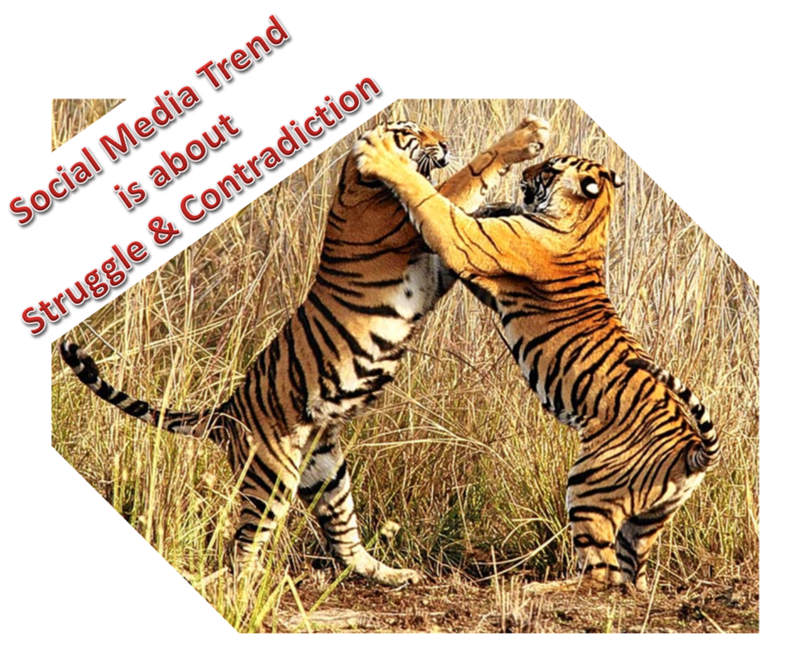 Struggle & Contradiction in 4 different dimensions – that is how I can summarize the trend in social media. Having said that I need to admit that in another dimension there is no struggle, no contradiction – it is going up … up … up. Whichever statistics you look at – whatever prediction you see; more people are accessing social media sites through their smartphones and tablets. More social media applications are getting downloaded. This trend is not going to decelerate in the near future. Of Facebook’s 845 million users, 425 million of them used Facebook’s mobile apps or its mobile Website in December 2011, up from the 350 million that Facebook reported last. This clearly shows that mobile usage is growing faster than Facebook’s desktop usage. Till Facebook came in, web was mostly open. Two of the key drivers behind the success of the Web are (1) the ease with which pages can be hyperlinked irrespective of where it is hosted and which site it belongs to and (2) the ease with which you can search a specific page which has been indexed by search engine mainly Google. However, most social media especially Facebook do not allow Google to search and index their pages. Even if you have access to specific pages in Facebook, you will not be able to search and find those pages using Google. You will necessarily have to login to Facebook and do the search. This is not true for sites like Wikipedia. But, is that not a fight between Facebook and Google? Anyway, this is true for most sites which require a login. So, what is the big problem? You may not want to classify this as a problem but you need to acknowledge that this is a big change because people are spending more and more time inside their favorite Social Media which is likely to be Facebook. What you do inside Facebook and what you do outside becomes almost two different worlds with very little linkage. Will this division increase in the coming future and make the web into multiple walled gardens? Will social media become more open preserving the open nature of the web? This issue was first raised by Tim-Berners Lee more than a year back but has again become a point of debate because of the coming IPO of Facebook. The views differ from “this is a serious problem” to “users don’t care” to “it is not a big problem” to “we need to do something about it”. On every count social media use is not only increasing but increasing very fast. There is also no shortage of expert opinion on the necessity of increasing social media presence like “how social media is indispensable to news reporting” to “why social commerce will take off in 2012” to “why business won’t be able to afford NOT to use social media for marketing”. This should translate into clear measurable benefit of social media influence … right? There are several studies which put a dampener on this enthusiasm. Here are 2 of them which paints not so rosy picture of impact of social media. In addition, experts are trying to figure out how to measure social influence. Can you go by the Klout score? Or, do you look at Kred or PeerIndex? You feel that social media cannot be ignored and you need to be present and invest in it. You are worried about how to justify the investment. BTW: Do you have to justify ROI on email? If you have to point out one company that is the prime source of the two contradictions mentioned above, it is obviously Facebook. However, for this point it is Google is the prime mover. To counter the influence of Facebook, Google has decided to go social, that is, to add a social dimension to everything that it does. Therefore, the search results have started showing so-and-so has either shared or liked this result. It has even started saying that you yourself have shared or +1ed this link. Because you immediately get the opinion of people you know and probably trust. Because you are stuck in a close loop where “A” influences “B” and “B” influences “A” creating a self-fulfilling prophecy. Traditional TV and the internet will probably converge and reshape the way we choose how, when and why we watch television. All of our media devices including our television sets, computers, laptops, tablets, and smartphones could come together to offer us more social and sharable television experiences that we can enjoy whenever we want. Many of us are no longer consuming digital content on a single device. We now have two screens when consuming media (TV + laptop, tablet + Phone etc) and the lines between those devices will become even more blurred. Instead, we tweet on our laptops while viewing a TV program, watch another show on their tablet during a commercial or look up lyrics on our smartphones while listening to a song on the radio. As consumers begin to access digital content from a wider variety of devices — including, most recently, smartphones and tablets — publishers are beginning to offer subscription packages that allow them to access content on all of those devices for one flat fee. Because of the acceleration of print to Tablet swap, the smart traditional publications are already making the transition, but many will get left behind as printed media will quickly become obsolete as time passes. This is one side of the picture. Social media are diverging and they are not interoperable…the walled garden effect that we had talked earlier. Will we see a Social Media Black Swan in 2012? No, I am not talking about Black Swan the movie; I am talking about the “Black Swan Theory” proposed by Nassim Nicholas Taleb. Till the black swan, a member of the species Cygnus Atratus, was described scientifically by English naturalist John Latham in 1790, people thought swan could only be white. Similarly, there are unexpected and unpredicted events happen in technology evolution which takes us by surprise. The event has a major impact and we try to rationalize as if it could have been expected. Are we going to witness any such event around Social Media in 2012? Excellent post Udayan, well detailed too. Hi Udayan, this is Shawn from Kred. Thanks for citing us in your blog entry. We see your Contradiction #1 as very much bound up with Contradiction #2. It is why we our score system in transparent and reliant on open data from the Twitter firehose. We are planning to add more networks to Kred very soon.